Each box contains 12 packs. Each pack contains 1 figures. 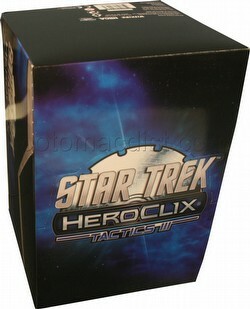 Featuring 28 different and ALL-NEW pre-painted starships to add to your Star Trek Tactics HeroClix collection, the Tactics III Counter Top Display includes models never-before-seen as 3-D figures. 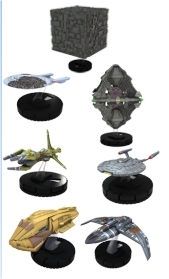 Star Trek Tactics III introduces 4 new factions and starships to HeroClix: the Bajorans, the Kazon, the mysterious Species 8472, and the Borg. Star Trek Tactics III also features an all-new ship type: Assimilated vessels with 2 team abilities (Borg and their former affiliation)! The set consists of 11 common, 10 uncommon, and 7 rare figures.